Small chips in a windscreen can grow and produce secondary cracks if not repaired, affecting the structure and integrity of the windscreen and obscuring the vision of the driver. 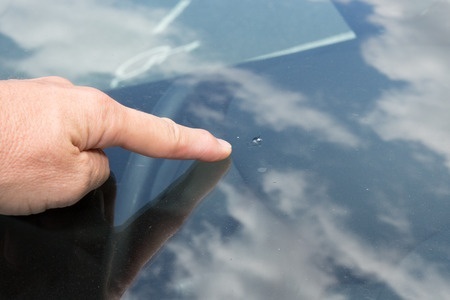 The longer they are left, the more likely it is that a windscreen repair won't be possible or will show, due to dirt and moisture adding to the damage. Windscreen repairs are a favoured solution over windscreen replacement for most people due to the cost saving and time saving attributes. Our expert windscreen repair technicians will endeavour, wherever possible, to repair a damaged windscreen whenever possible. If the windscreen damage is beyond repair, then we can provide and fit a replacement windscreen, side window or rear window. Windscreen repairs start by cleaning and drying the damaged area before applying a clear resin. The resin has optical properties which mimic glass, meaning that the damage, although still visible, should be far less predominent and structurally sound, preventing it getting worse due to frost, moisture, dirt, heat and vibration from driving. WHAT DAMAGE CAN BENEFIT FROM WINDSCREEN REPAIRS? Windscreen repairs can be used to fix stone chips and small cracks of varying sizes, depending on the area of the windscreen which they are located according to the approved code of practice BS AU 242a: 1998. The maximum size chip or crack allowed is listed below. If the damage to the windscreen is too big for the allocated area, then we can can provide and fit a replacement windscreen. Its not just winscreens that get chipped and cracked. More often than not, it is necessary to replace damaged side windows or rear windscreens as opposed to repairing. All of our replacement glass is sourced to fit your make and model of vehicle perfectly, whether that be a car, van, bus or coach. Our windscreen repair service is fast and competatively priced. We can undertake contracts to maintain the glass on commercial and haulage fleets. We appreciate that time is money and will get your glass fixed or replaced so that you can be back working as soon as possible.